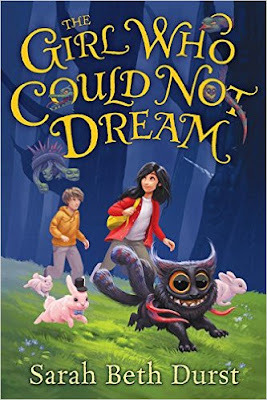 Synopsis: I'm catching up on some long-overdue reviews this week, and one of those is Sarah Beth Durst's latest middle-grade fantasy The Girl Who Could Not Dream. Sophie, the twelve-year-old main character, is the girl in question—and how strange and awful it is to be a person who is unable to dream when one's parents are, in fact, dream-sellers. Oh, ostensibly they own a bookshop, but there's a SECRET shop in the basement where all the dreams are stored in bottles; where they are distilled from dreamcatchers and readied for those special clients in the know. Though she herself does not have dreams, she knows their seductive and sometimes frightening power…because one time, as a child, she stole a dream in a bottle. And she discovered that, while she cannot dream, she can undeniably experience someone else's dream…and even bring things out. That's how she ended up with a pet monster. Named Monster. He's furry, like a cat….only with sharp teeth. Oh, and tentacles. And he's very protective of her, though he is always very careful never to be seen by the outside world. Observations: As with all of Durst's books, this one is undeniably fun, quirky, charming, magical, and really unlike anything else out there. Actually, if I had to compare it to anything, it would be the worlds created by Diana Wynne Jones, where magic exists in a kind of parallel, tangential plane but still alongside our own, visible to those with the ability to see it. Similarly, while there is gentle humor and a loving family portrayed here, there is also fear and danger lurking in the corner of one's eye, and plenty of excitement, as Sophie and Monster must spring into action to save Sophie's parents--and their livelihood. Durst's books always charm me with their imaginativeness, and this one is no exception. How wonderful, to bring all sorts of dream monsters and fears and mythical beasts to life, from frighteningly surreal Dali-esque creatures to good old flying unicorns. But, hands down, Monster is the best monster. I'll leave it to you to read the book and find out why. Conclusion: I'd recommend this one heartily to all readers of middle-grade fantasy, especially fans of Diana Wynne Jones's Christopher Chant books. It's just an all-around enjoyable story, and the author creates one of those worlds very like our own that you'll end up wishing you, too, could inhabit, nightmares and all. I received my review copy of this book courtesy of the author/publisher. You can find THE GIRL WHO COULD NOT DREAM by Sarah Beth Durst at an online e-tailer, or at a real life, independent bookstore near you! This sounds really cute - and thank you for reviewing it! It´s seems very interesting. She stole a dream in a bottle. I liked it.